Profound knowledge and practical experience of many years of our employees guarantee a competent advice at any time. Prof. Dr.-Ing. 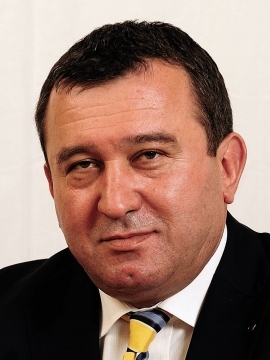 Gennadi Zikoridse is the director of the Research Institute for Automotive Engineering (FiF) at the Dresden University of Applied Science and holder of the professorship of automotive engineering / drive engineering in the degree course of automotive engineering. His courses offered include the subjects of piston engines, combustion engines, drive engineering and alternative drive systems. For the students of automotive engineering lectures and exercise courses as well as internships and seminars are offered in the main studies where additional knowledge is taught besides the fundamentals. Exhaust aftertreatment and thermodynamics for Otto engines and diesel engines are offered for additional information. Also the students of other degree courses such as general mechanical engineering as well as future industrial and environmental engineers and production engineers benefit from these courses offered. On the basis of his positions as the head of the institute and holder of the professorship Prof. Zikoridse is able to connect research and teaching in the best possible way. The students have the possibility of working on practically relevant diploma thesis or research paper subjects within the framework of the fields of work mentioned above. Due to the close relationship between research and teaching the FiF makes an important contribution to the high teaching quality of the students of the faculty of mechanical engineering / process engineering, in particular of the degree course of automotive engineering. The use of modern research technology for internships and the active participation of students, interns and Diplom degree candidates guarantee an optimal preparation of the graduates for their future work in the industry. About 25 Diplom degree candidates per year are advised by Prof. Zikoridse and his colleagues. Professor Zikoridse is an acknowledged scientist in the field of combustion engines and exhaust aftertreatment. His fields of research include the optimization of combustion engines, exhaust aftertreatment, alternative vehicle drive systems, alternative fuels and energy management in the vehicle. He is the author or co-author of about 100 publications, four specialist books and 138 technical lectures and five patents. Under the direction of Prof. Zikoridse international and national conferences and congresses such as the „Dresden Engine Colloquium“, the FAD-Conference „Challenge – Exhaust Aftertreatment for Diesel Engines“ as well as numerous seminars and workshops on current issues in the automotive and engine research are regularly organized. Professor Zikoridse is the executive director and scientific director of the Research Association for Diesel Emission Control Technologies -registered association- (FAD e. V.). He is the head or member of numerous commissions, working groups and task forces in national and international organizations. He works as a consultant for AiF [German Federation of Industrial Research Associations], BMBF [Federal Ministry of Education and Research], DBU [German Federal Foundation for Environment] and the Industrial Research Foundation, and he is and expert for exhaust aftertreatment systems.